Not often, but every now and then, I stop and wonder what you think of your little girl at age seven. I become aware, maybe just for a moment, on the walk back from dropping her off at school, at the grocery store picking up snacks for her class for their field trip, or sitting here writing, of the ringing of your absence. It is like when you sometimes hear a ringing in your ears that only you tune into, some other frequency, and then it is gone. “Do you hear that?” It is like that. The moment is kind of like T.S. Eliot’s “still point of the turning world,”still and sacred. The baby you left is a girl. What would you think of her? How would you interact with her? Would you ever scold her when she has her meltdowns or would you have let me always be the mean parent? Would you have laughed when she’s hyper and overly silly, or would you have told her to calm down? Would you have walked her up to school somedays? 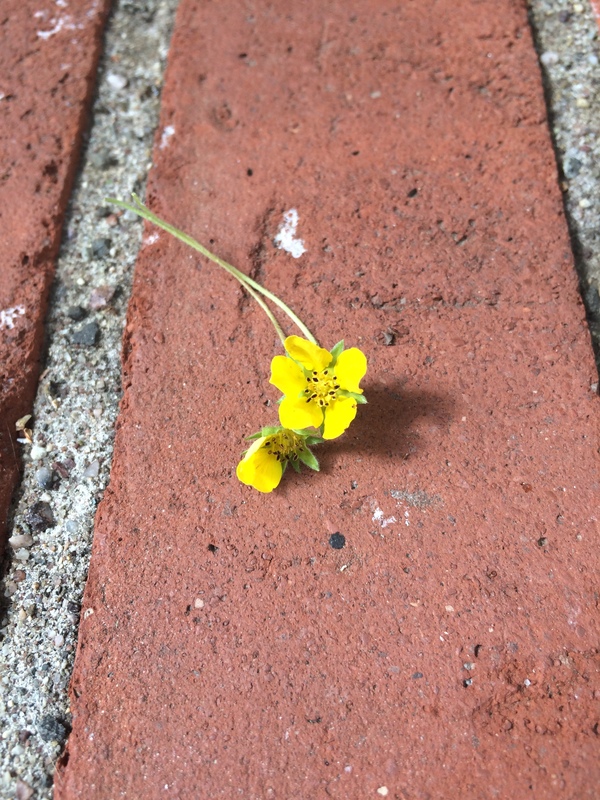 Today she picked two buttercups and gave them to me calling them “our mother/daughter flowers.” What would she have offered you? I don’t think it panders to my grief or means I’m going backwards to have these thoughts, but rather it feels holy—to wonder, to give you space- just for this still point of the turning world before I get on with the tasks of an ordinary Wednesday. She is so much yours, in appearance, but also in personality. She struggles with playing classical piano like you did, but she loves to sit down and play songs she knows by ear, or compose beautiful things. I can hear that she hears a lot more, and once her skills pick up, it will be lovely for those to come out too. One day I tell her that I can tell she hears a lot more, and she asks, “How did you know?” Just like you, she is a bit of a music snob and may have your perfect pitch- she can’t understand why everyone in her music class at school is singing so out of tune. She loves to sing and does so fairly loudly just about all the time. She has a 40’s lilt to her voice sometimes that is quite lovely. Her piano teacher says her rhythm is amazing; she definitely does not get that from me. Like you, she can really eat a lot, especially for her 50 pound body – five pancakes, four tacos, 3 slices of pizza- but I suspect she has your metabolism and will never be overweight. Just like you, she picks the sesame seeds off of her burger buns. Isn’t that strange? Remember all of the inventions you tried to patent? She too is coming up with new ideas and enterprises every day. One day it’s a store on our porch selling small origami chairs she makes, another she makes beaded bracelets with tiny labels that are stamped “Handmade,” and she has this cool idea for a transparent bubble just big enough to surround our bodies that we’d get in and hover up to school in. We’d adjust the temperature in winter and there’d be buttons to change the design. She talks about this a lot. Her little shoes, I realize one day, are wearing down on the bottoms just the way yours did, slightly on the left. She loves to read and is always on the highest level at school. We’re on the fifth book of The Chronicles of Narnia for our nightly story time together. Her voice starts to quiver sometimes when she gets to the passages about Aslan. Sometimes her eyes tear up. “He turned and saw, pacing beside him, taller than the horse, a Lion. The horse did not seem to be afraid of it or else could not see it. It was from the Lion that the light came. No one ever saw anything more terrible or beautiful.” “More terrible or beautiful,” she repeats slowly and quietly, looking up at me. She sleep walks a bit- once I found her in the corner of the kitchen wandering around, and she hates going to bed at night- more like me than you. She has a hard time getting up on weekdays but she is up early on weekends at her “art studio” creating something. She remembers a lot of her dreams and from what she tells me, she’s a lucid dreamer. She’s discovered, she says, that if she eats anything in a dream, it causes her to wake up, so if the dream is good, she refuses any of the food offered her in it, no matter how good it looks, or how tempting it is. “Just don’t eat it, whatever you do,” she says. She loves languages. She has invented two of her own, and has solidified one enough that we can have basic conversation in it. She is also really eager to learn Korean and so far I’ve taught her the alphabet. She’s fascinated with how words came to be and we are constantly looking up the etymology of many. She claims her fish are the most educated in the world because she’s taught them the parts of speech. She’s bored at school and hates being condescended to by the teachers and the lunch aids. She is an excellent observer and very intuitive when it comes to people. She can always tell when a grown-up is disingenuous. Her teacher tells her she’s in her desk too much. She tells me she was trying to crush some purple flowers she found to figure out how to make perfume in there, but she wasn’t successful; she made purple dye instead. She breaks off her pencil erasers and collects them in a ziploc bag in there. She even trims off the silver top with her scissors and forms it into tiny hearts. She calls it metal-working. She creates a sign out sheet for the crayons classmates want to borrow at her desk too. They sign out their name and the color they’re borrowing. “So if someone asks for, say…gold, I can just check and see who has gold…” she acts it out for me like she’s looking down a list. I can see why her teacher tells her she’s in her desk too much. She has your charm and the other-worldly joy that I fell in love with in you. How can I be sad when a little girl announces that she’s going to skip for the next month everywhere she goes in the house? Or when she tells me she created the “World’s Smallest Pencil” at school and put a little sign next to it on her desk that said so. She loves when the spring ants appear in the cracks of our walkway and begs for crumbs so she can feed them. She’ll watch them for hours. Once we noticed together that all of the ants were carrying particles out of the hole, but only one was trying to bring something in. She thought he was confused and still laughs about it when we recount that story. I was recently re-organizing all of her artwork and came across something from Pre-K. The teacher had written “My Christmas Wish” on the top of the paper and she drew a giant black ant and told her teacher to title it, “Black Ant.” Later she had told me, she started to draw and it just turned into an ant. There is so much more I could tell you about her. It would takes days and thousands of pages. But my still point is ending. The world is turning. I need to go grocery shopping and clean up, do some freelance work, and maybe take a walk. But oh, there is this. She loves her dad, and misses him very much. Her eyes fill with tears when she remembers your “disappearance” and the dreams she had up to a year later when you would disappear, the one where she woke up screaming at night in her crib for you, saying that she wanted to play with you. So, there is that. She loves you still. Even though I incorporate stories of you and bits of your personality in our daily conversation, even though I’ve compiled a huge book of letters and words from other people about you, there are afternoons where she randomly says, “But what was he like?” The other day she realizes she’s never seen me be affectionate with a man. “Did you ever do those long kisses like in romantic movies? I love those,” she says. Yeah, we did. 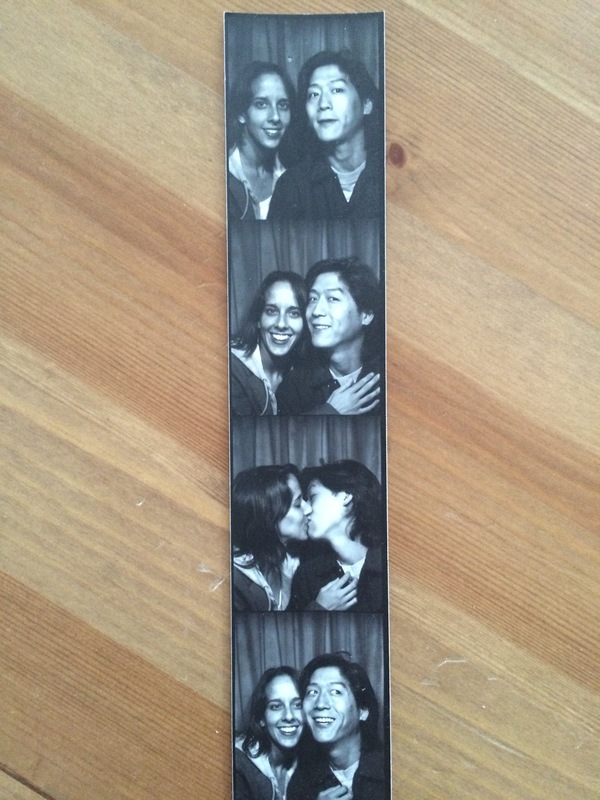 The next day I find these old photo booth pics we took and put them up on my bookshelf. She notices them right away, and seems pleased. She picks them up and sees us. Turning, turning, turning, calling me back to busyness and to-do lists. I will tell you more at the next still point. That is all for now. Beautiful, and heartbreaking. It’s like a love letter between the two of them, with you as the conduit. Achingly, breathtakingly poignant and beautiful. Thank you for sharing. Beautiful. I haven’t had a chance to read your entries as of late. I’ve been a bit overwhelmed with changes in life. I loved this and envy how you’re able to describe all the intricate ways in which you see him in her. Big moments flash in my face but I’m usually too busy to notice the little things. Yes you have been busy J! And you’re doing such an amazing job. Inspiring woman. A lovely, lovely post with which I can painfully relate. As my girls grow, I so wish that the one who was with them from the moment of their creation could see them, see what they are becoming…and love them. I think, though, more than having him see the two of them, I wish Erin and Claire could know what it would be like for their Dad to laugh with them, advise them, be proud of them…love them. I wonder how their relationships would have grown and changed as both he and the girls grew older. How would he have managed the teenage years? How would he be interacting with their boyfriends? Would he have shed a tear when he saw them dressed up for the prom? I think so. What would have been his reaction upon learning that both girls were going to UVa, both studying in the Engineering School…both being leaders in Jubilate? To see them dance…to hear them sing…to eat their delicious cooking…to visit their workplace….to see their page after page of high math….that reminds me of the mathwork he used to do. All very bittersweet thoughts. I often sit at the beach, watching families be together. I watch my girls doing whatever they are doing…paddle boarding, reading under the umbrella, drinking iced coffee, or jumping in the waves…I sit and wish their Dad was there with me to love watching them grow and change, and to marvel at what wonderful women they are becoming. I want it for him…and them…and me. The grief never goes away. It changes and I find different ways to wrap my mind around it, but the ache remains. My dear Cindy…thank you for sharing. From what I see on FB, your girls are growing up so beautifully- but you are so right- it doesn’t ever go away…it’s a life-long loss that changes and evolves as they grow. it’s not just the loss of the past or present, but of the future, and as the future unfolds- it resonates again, sometimes more acutely than others. Sending love. You’ve come so far and you inspire me. Love this entry. I connected with it right away because I do the same with both Gisele and Dylan. You’re an amazing mom Debbie. Sending love…let’s get together soon. Just so beautiful. Thanks for sharing. I haven’t commented in such a long time. But, I just had to take time to say, thank you for just a slice of your stillness. Thank you, Zikhona. Sometimes I’m not sure whether or not to share certain writings- if they’re just for me, or for others somehow. I follow my intuition about it, even if it sometimes feels too revealing, and I’m generally a private person. Thank you for affirming that. Thank you Kerri. Your comments have enriched my life as well. Hope you’re well. So precious!!! Forever her daddy’s girl!